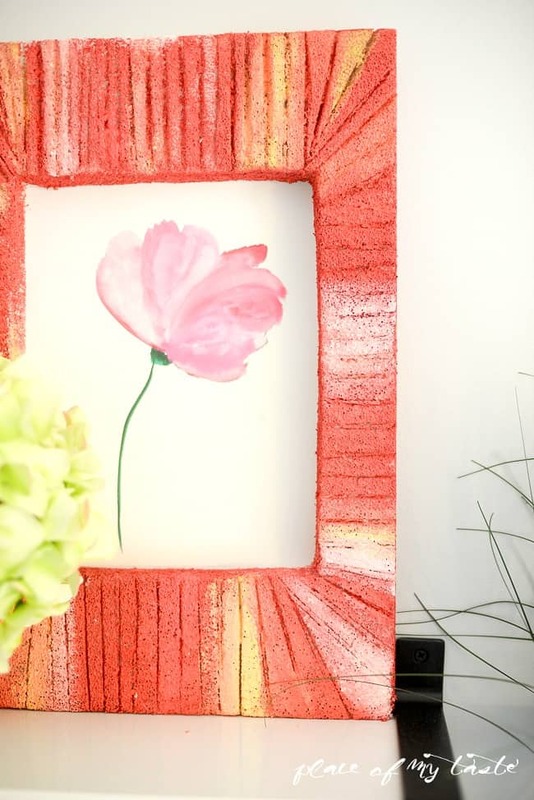 Today I am sharing a pretty quick and easy DIY wall art tutorial with you guys. 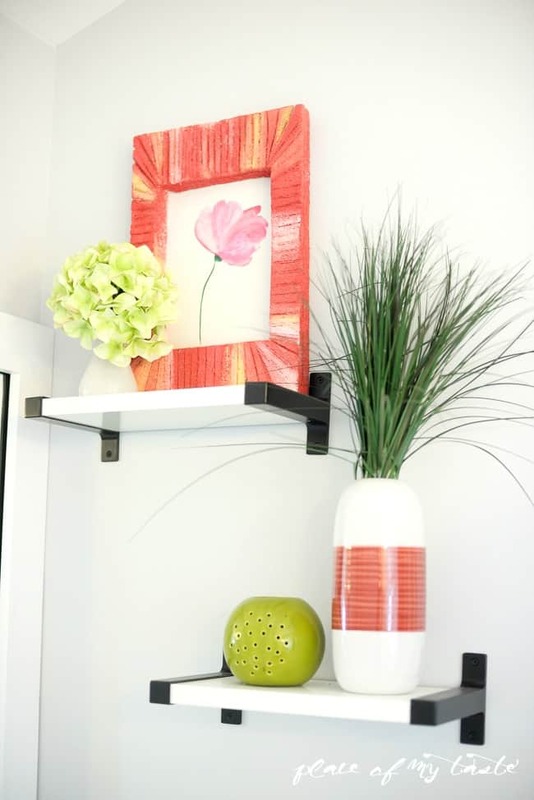 Wall art adds to any space, right? Couple months ago I shared our Bathroom makeover which I really -really love and I had that big empty wall above the bathtub that needed some help with decoration, as it was just too Blah. 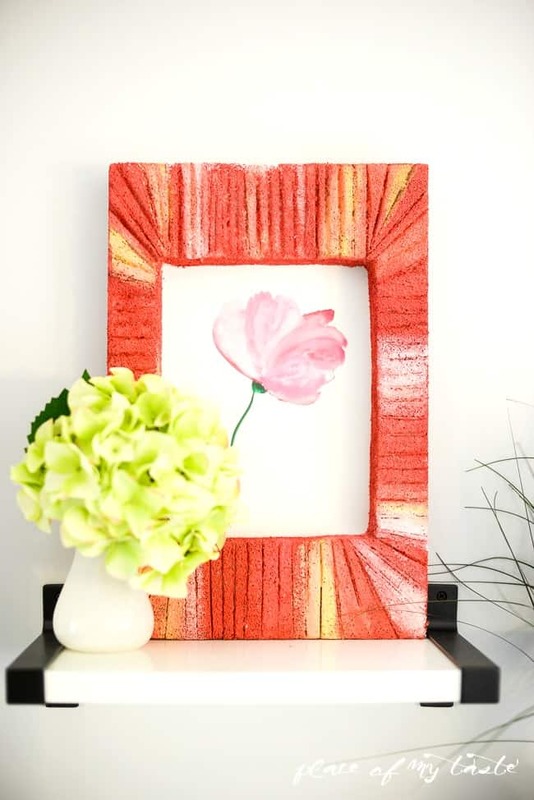 I used coral as an accent color in the bathroom so I created a pretty, colorful wall art that go with the color scheme. Few weeks ago I was contacted by Flora craft to create a fun project with their Make it: fun Foam sheets. Of course I nod my head and could not wait to start working on my project. Let’s get right into it and let me show you how you can create this easy, great looking wall art for your own home. First I glued together 3 sheets of thin StyroFoam so I could get a nice, thick look for my wall art. 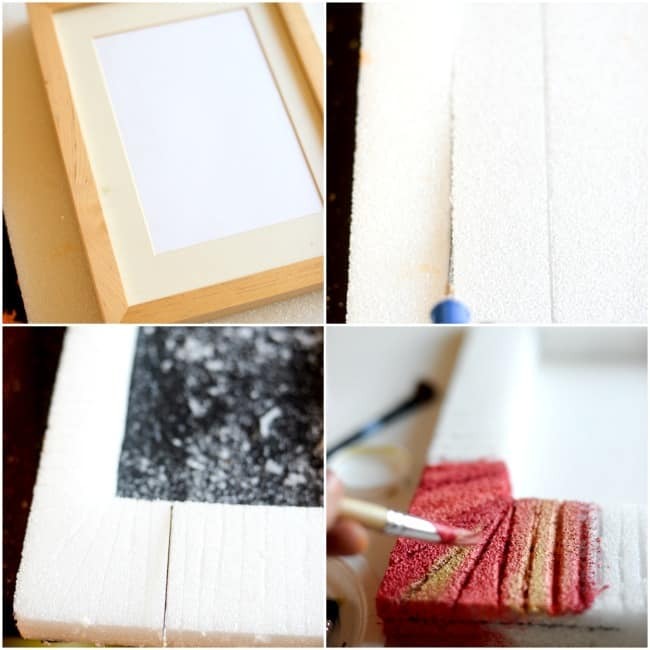 Once the sheets were glued together, I grabbed an old picture frame and draw the shape on my StyroFoam sheet. Then I cut out my shape using the Styrofoam cutter. With the cutter, I marked straight lines on the frame to make it look more interesting. *Tip: Use your cutter gently and slowly as the cutter is really thin to prevent braking it. As a last step I added my colors on. I played with it and mixed in coral , yellow and white to achieve the finished look. I love how it turned out and these bright colors look awesome in our bathroom. I had so much fun making this cute wall art. 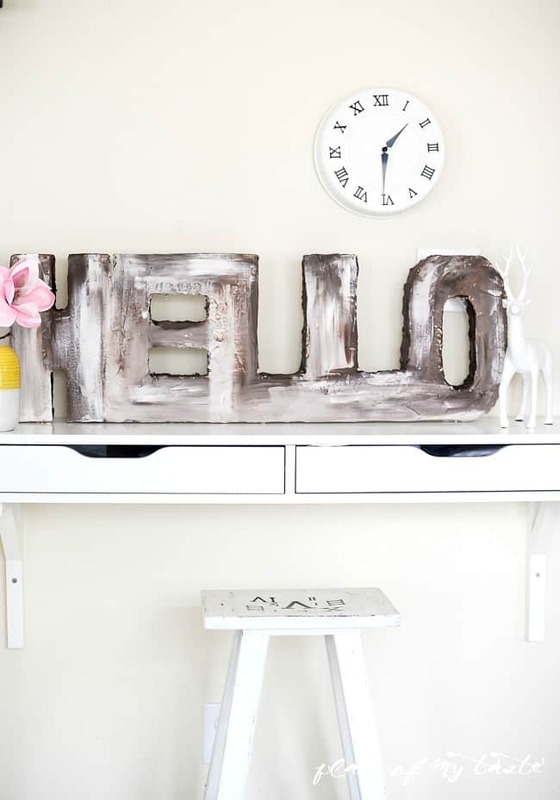 I also made a huge HELLO sign with my thick StyroFoam sheet. I wrote out HELLO with free hand and I cut around my letters with the cutter. This cutter is just amazing. The possibilities of making really great projects are endless. With this project I wanted to get different direction so I smoothed the surface with drywall paste. StyroFoam has a great product called SMOOTH FINISH that you can also use to smooth the surface and fill in the holes. 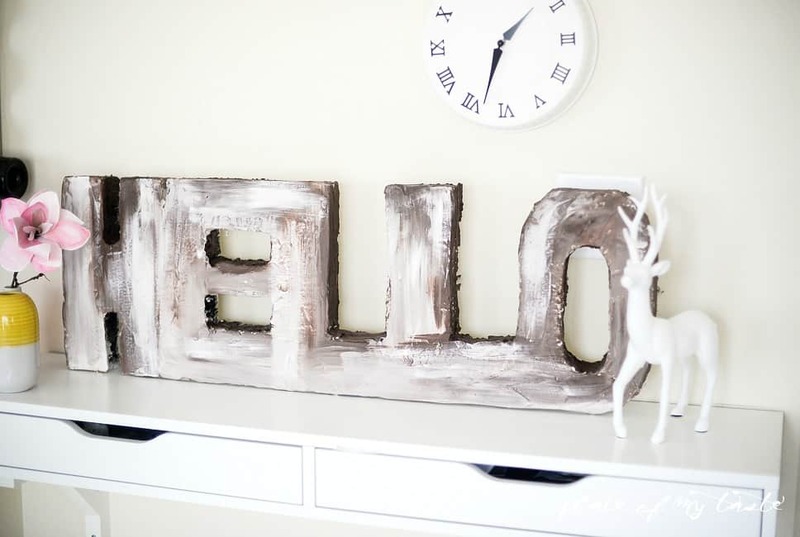 Then I painted my Hello sign with acrylic paint. Have a fun rest of your week! Hello, I love it, too! And the frame in the bathroom is adorable. Great colors. Well, HELLO! What a fun sign, really well done. And I love the frame, too — you chose beautiful colors, Thank you! Sharon, it was fun to get creative with this awesome product! Thanks, have a sweet weekend!! SUCH a fun idea! LOVE the texture and colour you added to it! Just beautiful! I had no idea you could paint Styrofoam! So cool! Love what you did with the frame!